In 1964 an Urban League survey ranked Los Angeles as the most desirable city for African Americans to live in. In 1965 the city burst into flames during one of the worst race riots in the nation's history. How the city came to such a pass—embodying both the best and worst of what urban America offered black migrants from the South—is the story told for the first time in this history of modern black Los Angeles. 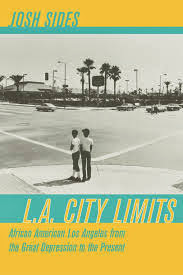 A clear-eyed and compelling look at black struggles for equality in L.A.'s neighborhoods, schools, and workplaces from the Great Depression to our day, L.A. City Limits critically refocuses the ongoing debate about the origins of America's racial and urban crisis. Challenging previous analysts' near-exclusive focus on northern "rust-belt" cities devastated by de-industrialization, Josh Sides asserts that the cities to which black southerners migrated profoundly affected how they fared. He shows how L.A.'s diverse racial composition, dispersive geography, and dynamic postwar economy often created opportunities—and limits—quite different from those encountered by blacks in the urban North.